It has been rumored that Randy Green had to don a fake eagle beak as a disguise to fool the fish, but after many attempts in Alaska's Kenai River, he finally landed a king salmon and did it in a big way. 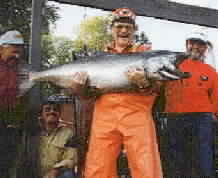 Randy is shown in the photos with his 45 lb. trophy caught July 13, 1999. Anglers and fishing guides out of Krogs Kamp in Alaska's Kenai Peninsula are speculating that this is the year the king salmon record could be broken. Many stories are traded about "the one that got away", and many times big fish are actually broken off the hook by anglers thinking they are snagged on obstacles on the river bottom. The water level in the Kenai River has been higher than normal this summer, but the color and clarity have been good. Along with the kings, good numbers of red salmon have been entering the river each day, and with the bag limit at 6 per day, angler's should have no problem keeping busy and providing a family meal or two. In August the dancing silver salmon start entering the river and stay well into fall. For more information on Alaskan fishing on the Kenai river, visit Krogs Kamp. Find year round Alaskan adventure like Mike Rollings of Utah did with a 65 pound bright king salmon!